When the Southern States of the Union secede in 1861, the bloodiest war fought on American soil was begun. Some 600,000 of our citizens died and many hundreds of thousands were left scarred. Brothers were pitted against brother, in a war fought over many issues, for 4 years. The prices were indeed catastrophic. Our Brothers at War wines were made to commemorate those who fought and died for our freedom. 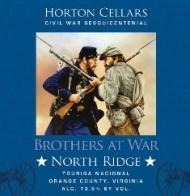 North Ridge “Union Red” Made from 100% Touriga Nacional. Displays bold dark fruit flavors with firm tannins. With a nice dry earthy tone and a black pepper finish. It’s aged in French American Oak. Pairs nice with red meat, grilled lamb chops and it does well with aged cheddars.